Posted by Zach Brooks at 10:30 am, October 24th, 2007 under Midtown Links. A picture of one of my favorite Midtown Lunch dishes. Outstanding. That dish from SG isnt that good. 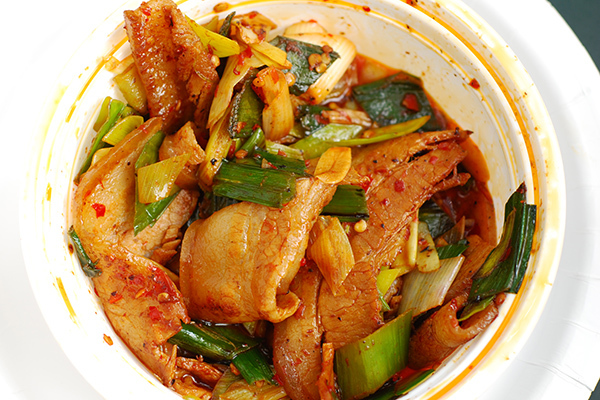 Their double cooked sliced pork belly w. chili leeks tastes the same as the stir fried fresh pork belly w. chili leeks. The garlic bits they throw in are always way undercooked. I love garlic but when there’s that much and it burns more than the chiles, peppercorns and hot chili oil do… YUCK. The shredded pork with spicy garlic sauce is actually a lot better if you’re in the mood for pork. Hmmm.. SRI, we just run in different circles I guess. I’ve never had an experience where garlic burns more than chilis (regardless of restaurant). This was the first time I had their lunch special, but next time will take up your suggestion and try the shredded pork. Yeah, it’s like eating a giant bowl of bacon. In theory it sounds great, but I found it pretty hard to do. Belly pork should be roasted over a ban marie at a very high heat fat side up..so the fat and skin crisps/crinkles and the steam from the banmarie keeps the meat moist.Rubbing 5 spice/Guram masala mix into the fat before cooking hleps too. The texture of the crackling and super moist meat……hmmmm..im having a liv tyler moment. Does no one else think that Yakitoro Toto is a really disturbing name? Cairn Terrier on a stick isn’t my idea of a healthy midtown lunch. i just hit the 38th st restaurant & bakery for lunch today. you intrigued me with your prior post but the NYT pushed me over the edge. i work a block away and have always peered in walking by, so i have no excuse for not visiting before… i got the pork, duck, and bok choy. i gotta say its the most fulfilling 3.75 i’ve ever spent in this neighborhood. thats even cheaper than the halal cart. Just tried Szechuan Gourmet for the first time today. Both my buddy and I had the double cooked pork belly with chili leeks, and we both loved it. The real heat lets you know you’re alive. I don’t love the idea of eating so much pure fat, but it sure tasted great. Thanks to all those who recommended it. It’s my new once-a-weeker.